Sorry, this item is no longer available. Please shop for other Kalevala items. More about Kalevala Bird of Hattula Bronze Pendant Necklace Kalevala Koru jewelry borrows on beliefs from antiquity. In ancient times, animals were endowed with powers that people lacked – the gods were thought to speak through animals. Birds in particular were considered a messenger of the gods, so the bird motif was widely used in ancient jewelry. The earliest origins of bird jewelry are difficult to trace, but in Finnish jewelry traditions, the bird has always symbolized health, wealth and success. Because waterfowl were a symbol of fertility, webbed feet were a common motif in women's jewelry. The prototype for this piece dates from 1000 A.D. Made in Finland. 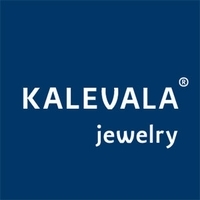 View our entire Kalevala Bird of Hattula collection. This necklace is so awesome! I love it!!! It looks even better than the photo. I love the jewelry on ur website! I also enjoy your chocolate as well! I will also be ordering more of that very soon!! This sweet pendant came in the post today, so I popped it on before walking down to the Wednesday afternoon Farmers' Market. I was only there for 10 minutes (knew just what I needed), but I picked up three compliments on the necklace! It's so unusual and fun! Yay! I love this necklace! 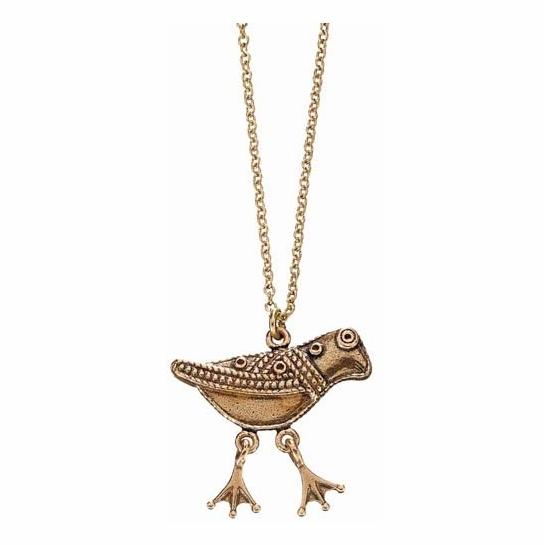 The small bronze bird is just the right size and the chain is nice. I love that the legs move. This is a very unusual piece that has a primal look to it. So happy that I bought it. 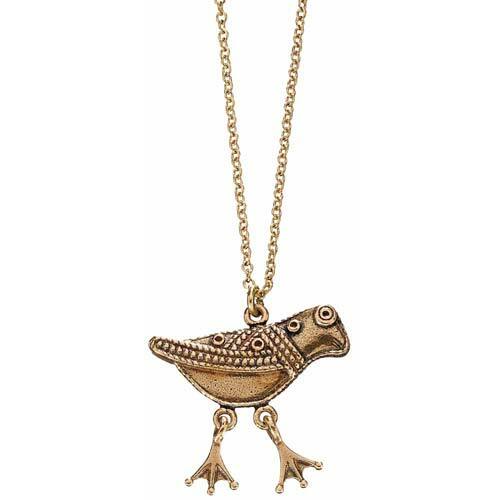 The "small" bird is generously sized and the chain is just the right length. The bronze metal is substantial; it's not gold but definitely does not look cheap. The legs are articulated--such a fun touch! This is for my mom, and I can't wait to give it to her, but I'm also itching to buy one for myself.